Definition - What does Crescent Lunge Pose mean? Crescent lunge pose is a basic beginner standing yoga pose that stretches and strengthens the legs, back and arms. 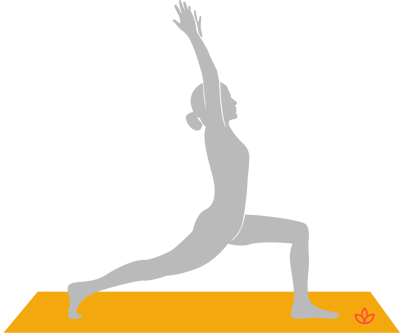 It is sometimes also referred to as a crescent variation of high lunge pose. Starting in downward-facing dog pose, one foot steps forward between the hands. Back leg is strong and the front knee bends to a 90-degree angle, with the knee right above the ankle and foot pointing forward. The back heel lifts, coming onto the ball of the back foot. Then, with an inhale, the torso lifts upright and arms reach overhead, palms facing. Tailbone lengthens and the ribs are drawn inward. Crescent lunge pose may also be referred to by its Sanskrit name, ashta chandrasana. Crescent lunge is a backbend and a heart opener. It improves focus, concentration and balance and integrates the muscles of the whole body. It strengthens the thighs and hips and develops both stability and flexibility. Expanding the front of the body helps to eliminate fatigue and increase energy. If it is too challenging to practice this pose, the low version with the back knee on the mat and toes untucked can be practiced instead. If there is a problem with the soulders or upper body, hands can be placed on the hips, or in anjali mudra in front of the chest instead of reaching the arms overhead.